While the real estate market on the Highlands/Cashiers Plateau did show some remarkable gains in June, July has put the market near par. While this is certainly not bad news, it’s not the best news for Sellers. 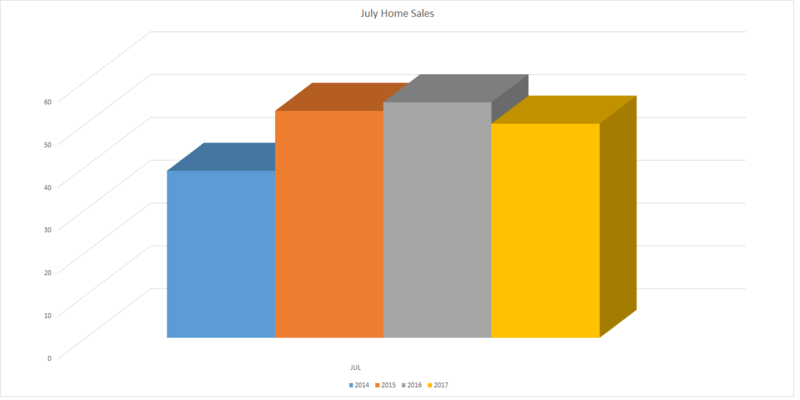 In the bar graph (click to enlarge) we can see the last four years of home sales for the month of July. While July 2017 is down a little, we can see that home sales in Highlands and Cashiers area do seem to be holding steady overall. While this is much better than a down-turned market, it certainly is not reflective of what’s going on around the rest of the nation in the majority of markets. The Federal Housing Finance Agency has been reporting an increase in home pricing. REALTOR.com® has also shown Asheville, NC as the #3 affordable city in North America. While real estate is moving around the country and Highlands and Cashiers are among some of the most beautiful areas to live, it would seem that these are still considered hidden treasures to many home buyers. However, change is in the air. As we head into the coming months ahead, we find home sales to be at their highest from August into October. Important to note is that these are“closed” home sales. The reason that this is important is that it can easily take 30 – 60 days for a home to close once it goes under contract. This means that a home that goes under contract in September may not show up until the October/November report. What does this mean for Sellers? If you want your home to close this season, you may want to take strides to ensure it goes under contract by September. Make sure you are marketed. However, all the marketing in the world will not sell your home if you are not priced correctly. Talk to your real estate agent. They, too, want to sell your home. If not much is happening, this can usually be related back to the price you may have on your home. Homes Sold This Month: 50 – While this is down from June Home sales, we see it to be somewhat average. YOY Inventory: 25 months – This is about 4 times higher than what is considered to be a “healthy” market. As a result, this will continue to keep home prices low. Average DOM: 337 – While this is high compared to most markets, this is typical for this market area. Average DOM (YOY): 408 – This continues to drop, which shows overall DOM is decreasing. Homes seem to be moving, albeit somewhat slowly. Median Sales Price: $327,500 . Average List/Sell Ratio: 91.79% – In other words, Sellers are only receiving 91.79% of their asking price. There can be several reasons for this, but the #1 reason is that homes are considered to be priced too high. This is not good for Sellers. Agents that list too high are doing a disservice to their clients as Buyers easily recognize overpriced properties and will not look at them. Sellers that ask their agent to list for a higher price may be “shooting themselves in the foot.” There is often a mistaken attitude by some that, “Their going to try to low-ball anyway, so we’ll just ask for more.” The problem with that theory is that if you’re overpriced to begin with, people won’t look at your home. Synopsis: While the real estate market shows great signs in many parts of the country, every market is different. You can’t judge this market by what others may or may not be doing. Talk with your Broker. They will offer advise according to your needs. Land Units Sold: 14. This is not a good market for land. Inventory: 6.6 years. There are simply too many homes and land available to justify development of land. Land prices are at their lowest. The majority of any lots that do sell are inside of country clubs or properties that have great amenities. Rural land is nearly at a standstill. Synopsis: If you want to sell your land, you’ll basically need to accept much less than anticipated. Tax assessment is typically considered high and not near land value. Outlying parcels are the hardest to sell. 40% of home sales ranged from $200,000 to $499,999. 8% of sales were above $1,000,000 (129% increase!). BUYERS: This is still a great market for you! This region is typically on about a 3 year curve. That is, what is going on in the market elsewhere typically takes about 3 years to reflect in this market area. As a result, it would seem that the market may begin to change soon. Now may be the best time for Buyers to link low interest rates with low home pricing. SELLERS: Will the market change? No one has a crystal ball nor can they tell the future. Indications around the country show a stronger real estate market. Again, the trend in this region has typically been about a 3 year lag. That is, what happens elsewhere usually happens here, but about 3 years later. While one would hold hope that the market will increase in this area, current statistics clearly show much to be the same. Where is Property Selling and How Do I Sell My Home? Click on the image of the Highlands Cashiers area below for a larger map. It’s easy to see the clusters of home sales. The majority are near town, whether that be in Highlands or Cashiers. The next major area is around Sapphire, NC. As you look outside of those clusters, you see that very little is happening, as the map shows all home sales for the month of July in the Highlands/Cashiers MLS. The map above was homes sold in July 2017 (50). The following map is homes for sale July 2017 (1246). What you can’t see in this map is how many homes are on top of the others. There are 1246 homes for sale on this map. Now imagine there are only 50 Buyers for these over 1,000 homes. Which 50 will they choose? It will be those priced most correctly. There are simply too many homes for a buyer to choose from. They have the “pick of the litter,” as they say. Then when you add to it that the majority of the homes are those closer to town, this can be very limiting from a Sellers standpoint. What will stand out to a Buyer is PRICE. Sellers often do not like to hear their Broker talk about lowering the price. Truth is, Brokers don’t like it either because that means they will get paid less. Still, it’s hard to argue with the facts. No matter what any of us “want” we have to be realistic and understand the market. If a home is not priced correctly, it will be difficult, if not impossible to sale. CONCLUSION: “It is what it is.” My wife hates it when I say that. Still, it’s a simple fact. We can’t make things what they are not, as much as we may like to. The real estate market is where it is. We can hope, speculate, mope, etc, but none of that will change the facts. Previous PostHighlands Cashiers Real Estate Holds Promise for 2017Next PostEarly Fall Expected (real estate, not the season)?